Suggesting that Resort is the unsung hero of fashion collections is far closer to intuitively correct than offensively foolish. What would be foolish is buyers and retailers not stocking up on Resort because of the versatility of the pieces and the advantage of a long selling season. Forget the fact that you may be trying to shop for t-shirts in the winter or jackets in the summer, with air conditioning and central heat. Fashion has rose above the necessity of dressing for the elements. A lot of what we wear is part of our permanent year round closet, making Resort and Pre-Fall just as, if not more so, important than the infamous spring and fall. 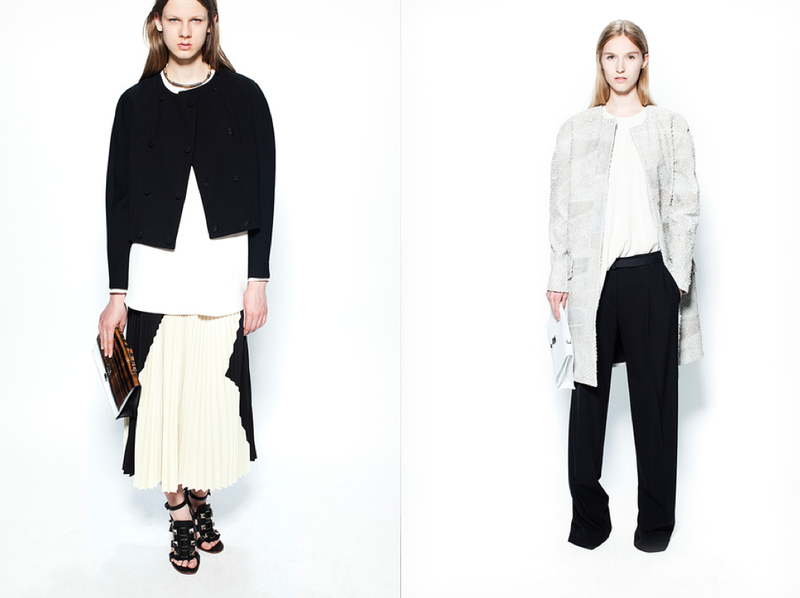 The “Resort 2014” collections offered nothing but the idea of simplicity and movement. Designers have been obsessed with heavily layering for many seasons now and this time around it was all about wearable clothing with defined tailoring and shape. Acne proved that a functional gardening look shall include loose-fitted shorts and a pullover paired with an over-sized trench and platform sandals effortlessly put together. The monochromatic pant suits and close-fitting dresses that need a knot because the tails were too long, with jackets that slung over the shoulders, diminished some of the glamour. Less is more. Meanwhile over at Chloe, where the sartorial soft layering was high in volume, the larger tailored pant, and the cropped top made us learn a thing or two about proportion, while bringing back the versatility to style of dress. Trousers came in many variations high-waist, over-sized, and cropped with a detailed pleat that proved the proportions were meant to be relaxed to be able to have the versatility to be worn with a flat or single sole pump. There were great bits throughout, such as the denim trench and basic pullovers paired with a button up and copped trousers that exuded a ladylike chicness. Derek Lam’s travel inspired collection remained very elegant. If there was anything on his mind for Resort it was “what can make the suit look new?” he did just that by the masculine yet feminine minimal styling and high contrasted looks paired with a cage like heel that effortlessly completed each outfit. Phillip Lim’s muse for this collection was vacation. Play while you work, or work while you play and look chic while doing so, the Phillip Lim girl would obviously combine them both. The transition from the downtown girl to maturity was more than evident, the proportions were lessoned and got wider, let’s not forget the aggressive styling. The laser cut leather detailing and pops of color perfected the cool sophistication. Thakoon brought nothing but a breath of fresh air for this Resort collection, with the deconstructing layers and cool crisp white pieces that defined the definition of “fresh.” The challenge was to elevate the white shirt by adding sheer and lace panels, proved just that. Daywear soon shifted into nightwear, there were jumpsuits, tailored trousers, blazers, and cocoon coats with a bedazzled neckline. Theyskens’ aimed to ensure that each and every piece from the collection was a real essential. Although their was a tight edit in silhouettes, the minimal wearable separates were relatable, but still asserted Theory’s uniqueness in each piece. There was deconstructed denim, and of course structured tailored jackets, and tastefully showing a sliver of stomach underneath it all. This collection offered nothing short of a complete wardrobe. This years CFDA designer of the year award winner Proenza Schouler, placed great emphasis on movement by allowing the clothing to drape. The pleated skirts in a color-blocked cloque and silk t-shirt defined the interest in movement, paired with the shoulder friendly jackets. There was a sense of looseness this collection and just a glimpse of what to expect for spring. Last but not least, DKNY used lace and metallic sequins which can easily be pegged as a nighttime look, and translated them into a more everyday wardrobe essential. The sporty silhouettes with heavy detailing, bomber jackets, and track pants paired with pointy single sole pumps and a baseball cap, made it easy for the athletic pieces to transition right back into evening wear. From top to bottom: (1-4) Acne Studios, (5-8) Chloe, (9-10) Derek Lam, (11-16) 3.1 Phillip Lim, (17-18) Thakoon, (19-22) Theyskens Theory, (23-26) Proenza Schouler, (27-30) DKNY.